iBebe is a great application for the parents who want follow the development of their baby. 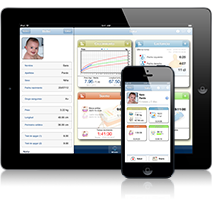 With iBebe you can track your child's growth and match his/her development to the international growth charts. You can log and check the time between breastfeeding sessions, how long each feeding lasts, the number of bottles fed or last breast used. iBebe allows you to easily log your baby's sleep and display it on the charts, know in which position he/she slept, what your baby needs to go to sleep (pacifier, music, etc. ), or record his/her sleep quality. Remember when your baby took the last medication, recall doses, vaccines or doctor visits. - Track feeding: bottle and nursing. - Growth charts: height, weight, head circumference. - Display graphic charts of the baby's activities. - Track medications, vaccinations, allergies and doctor visits. - Timer to track naps, nursing duration and diaper changes. - Share events with your friends and family through social networks or email. English, Spanish, French, Italian, Portuguese, German, Greek, Turkish, Russian, Danish, Dutch, Finnish, Norwegian, Swedish and Chinese. You can buy iBebe at App Store.